Gout is caused by three things: overproduction of uric acid, under-excretion of uric acid, or overconsumption of purines. Here, we tell you how to treat gout and how to prevent gout. UCLA researchers recently designed a cost-effective and portable imaging system that can diagnose gout. Gout is a form of arthritis that occurs when there is too much uric acid in the blood, tissues, and urine. Accumulating uric acid crystallizes and takes on a needle-like shape, jabbing into the joints (usually the big toe, but also other joints, including those of the mid-foot, ankle, knees, wrists, and fingers). It causes excruciating pain and joint destruction, and may lead to heart attacks, type 2 diabetes, and premature death. 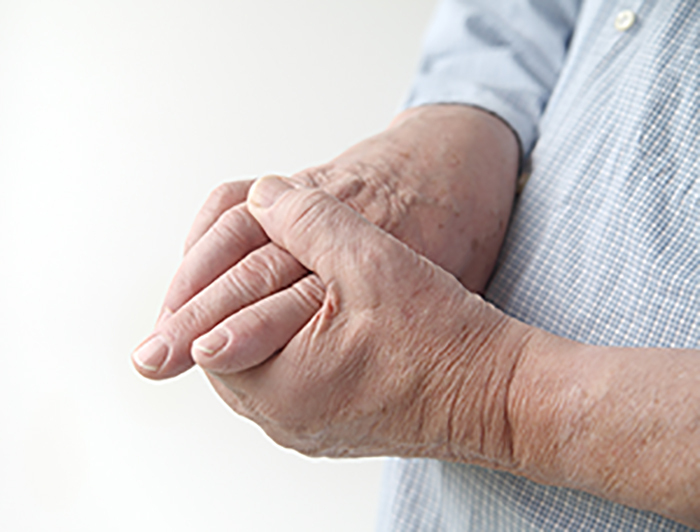 Acute joint pain is usually the first symptom of a gout attack, followed by inflammation. In the beginning, gout attacks usually involve only one joint at a time and resolve spontaneously within two weeks, with joints going back to normal between attacks. Over time, gout attacks tend to involve multiple joints at once, occur more frequently, and last longer. Eventually, if gout attacks continue, joint damage (chronic arthritis) occurs in multiple joints. Overproduction of uric acid can be caused by being overweight or obese. The heavier you are, the greater the risk. In addition to obesity, the body may make too much uric acid because of excessive exercise, chemotherapy, recent trauma or surgery, genetic defects, or health problems such as psoriasis or hemolytic anemia. Under-excretion of uric acid can be caused by dehydration, use of diuretics, kidney disease, severe calorie restriction, and alcohol intake. The risk varies substantially according to type of alcoholic beverage: beer confers a larger risk than hard alcohol, whereas moderate wine drinking (two servings per day for men and one for women) does not increase the risk. Sugar (sucrose) and fructose (especially high-fructose corn syrup) also increase uric acid levels and risk of gout. Drinking two or more sugar and/or high fructose corn syrup-sweetened soft drinks per day nearly doubles the risk of gout in men and more than doubles the risk in women. Sugar-sweetened beverages appear to increase gout risk to a similar degree as those sweetened with high-fructose corn syrup. Once the acute attack is controlled, the NSAID dosage is reduced to approximately one-half to one-fourth of that amount, tapered over approximately two weeks. Gout symptoms should be absent for at least two days before the NSAID is discontinued. After the acute attack subsides, conventional treatment of gout involves the long-term use of drugs used to lower uric acid levels, such as allopurinol and febuxostat, with the goal of reducing serum uric acid levels to below 5 or 6 mg/dL.8 The uric-acid lowering drugs can actually cause acute gout flares with initial use, so an anti-inflammatory such as colchicine or an NSAID is usually prescribed in conjunction for the first six months. Approximately 3 to 10 percent of patients taking allopurinol develop symptoms of intolerance, such as dyspepsia, headache, diarrhea, or an itchy rash. Rarely, it causes a delayed allergic reaction that can lead to organ failure and death.8 NSAIDs should be avoided in patients with a history of peptic ulcer disease or gastrointestinal bleeding, those with kidney or liver disease, and those taking warfarin. They must be used cautiously in patients with diabetes and those who are receiving concomitant angiotensin-converting enzyme (ACE) inhibitors. NSAIDs should be limited in elderly patients, because of the potential for adverse central nervous system effects. Colchicine can lead to marrow toxicity and muscle weakness, and often causes GI upset. Completely avoid organ meats (liver, kidney, sweetbreads) and decrease the amount of meat and high-purine seafood (shellfish, sardines, etc.) you eat.9 The less meat, the better. Decrease alcohol, particularly beer. Men should have no more than two servings of alcohol a day and women should have no more than one a day. Completely eliminate all sweetened beverages, including soft drinks, fruit drinks, energy drinks, sports drinks, and sweetened tea/coffee drinks. Natural juices should also be avoided, except for cherry juice. Decrease foods containing refined sugars and high fructose corn syrup. Eat cherries, drink cherry juice, or take cherry juice concentrate or a cherry extract supplement daily to decrease uric acid levels. [13-15] Eat 10 to 12 unsweetened fresh, canned, or frozen cherries; take 2 tablespoons cherry juice concentrate; drink 1 cup unsweetened cherry juice; or take 1,000 mg cherry extract in supplement form daily. The higher your vitamin C intake, the lower your uric acid levels. Aim for 1,500 mg per day through a combination of vitamin C-rich foods (kiwi, strawberries, peppers, etc.) and supplements. Do not drink orange juice as a source of vitamin C since it is loaded with natural fructose and has been shown to increase uric acid levels. For acute gout attacks, the natural therapies discussed above can be used alone or alongside conventional treatment. While you may want to use a conventional pain reliever or anti-inflammatory for short-term relief of acute attacks, safe and effective natural therapies should be your preferred choice for long-term gout management and prevention. For example, many people have reported keeping their gout symptoms under control by watching their diet and eating 10 to 12 cherries a day or by taking a tart cherry powder extract. 1. Arthritis Rheum. 2011 Oct;63(10):3136-41. 2. J Rheumatol. 2004 Aug;31(8):1582-7. 3. Lancet. 2004 Apr 17;363(9417):1277-81. 4. N Engl J Med. 2004 Mar 11;350(11):1093-103. 5. PLoS One. 2012; 7(6): e38123. 6. Ann Rheum Dis. 2014 Dec;73(12):2101-6. 7. JAMA. 2010 Nov 24; 304(20): 2270–2278. 8. Emedicine. Medscape. Gout and Pseudogout. 9. Arthritis Care Res (Hoboken). 2012 Oct; 64(10): 1431–1446. 12. Ann Rheum Dis. 2010 Sep;69(9):1677-82. 13. J Nutr. 2003 Jun;133(6):1826-9. 14. J Arthritis. 2012; 1:101. 15. Arthritis Rheum. 2012 Dec;64(12):4004-11. 16. Arthritis Care Res (Hoboken). 2011 Sep;63(9):1295-306. 17. Arch Intern Med. 2009 Mar 9;169(5):502-7. Originally published in 2015, this post is regularly updated by the University Health News staff. 2 diabetes, ace inhibitors, acute gout, acute joint pain, alcohol, allergic reaction, anemia, angiotensin, anti inflammatory, anti inflammatory drugs, arthritis, arthritis care, beer, cauliflower, causes gout, central nervous system, chemotherapy, chronic arthritis, coffee, corn, corn syrup, dairy, dehydration, diabetes, diarrhea, diet, energy drinks, exercise, gastrointestinal, gout, gout attack, gout attacks, gout diet, gout is caused by, gout symptoms, gout treatment, headache diarrhea, health, health news, health problems, heart attacks, high fructose corn syrup, high uric acid, inflammation, joint pain, liver disease, low fat dairy, muscle, natural therapies, natural treatment, nsaids, nutrition, obesity, pain, peptic ulcer, peptic ulcer disease, psoriasis, purine, purines, spinach, sugar, supplement, supplements, type 2 diabetes, ulcer, ulcer disease, university health news, uric acid, vegetables, vitamin, vitamin c, what causes gout, wine. “Gout” is a term I have heard many times but have never looked up. Thanks!